Liftruck is the UK’s leading ‘one stop shop’ for all manual handling solutions, with an ever growing number of customers. It sells everything from pallet trucks, manual stackers and mobile scissor lift tables, through to a wide variety of forklift attachments and forklift forks. The company aims to support British industry, and many of its products are manufactured in the UK. As a market leader, the web is vital to Liftruck’s business model, and the company first ventured onto the web in 1999. 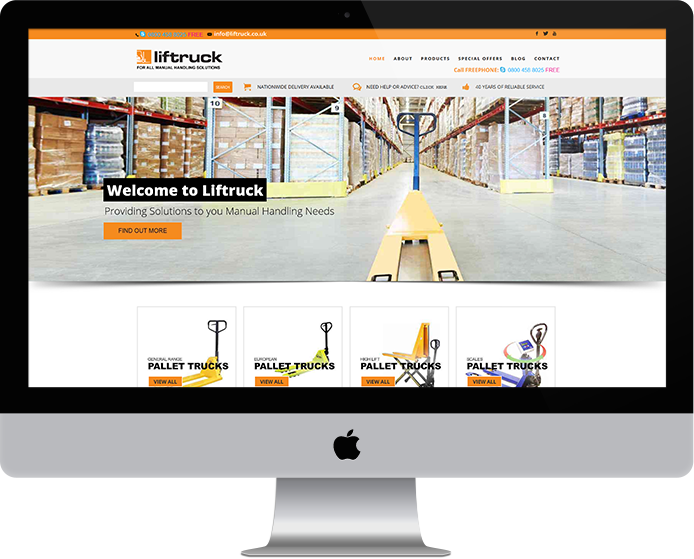 With a customer base that was moving increasingly online, our brief was to deliver a new, dynamic content management system and full e-commerce package to showcase Liftruck’s huge product range and allow customers to easily make purchases. This involved a conversion of 311 pages from a static site to the new CMS, and ensuring the e-commerce element smoothly integrated with Liftruck’s existing sales and customer relationship management systems. We also integrated two existing website domains into one new site, optimised for better usability and search engine optimisation. The resulting Liftruck website provides a user-friendly and intuitive experience for customers, and has supported increasing sales.